The year is 1888, the clockwork British Empire is crumbling, and young writer Ivy Savage has literally received a heart in the post. Terrified, her father sends her north to a strange sanitarium in Lancashire where the brilliant but unpredictable “Mad Lord of Lasingstoke” makes his home. Here, Ivy finds the dead are as dangerous as the living, and she is immediately swept into a world of manners, mystery, and supernatural intrigue, uncovering a secret that will lead both her and the Mad Lord back to London and the dark streets of Whitechapel. As with her fantastic Tales from the Upper Kingdom series, Dickson charmed me. She convinced me I'd figured out her twists and then several times, without so much as an 'if you please,' showed me I was completely and deliciously incorrect. 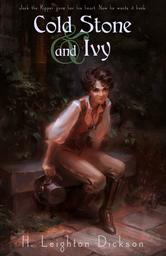 Cold Stone and Ivy ties up a comprehensive and well engineered plot with unique characters and fascinating steampunk scenes. My two favourite characters are Ivy, crime fiction writer and daughter of the Police Inspector, and the Mad Lord himself, Sebastien. Along with Jack the Ripper and the top hat and cloak in which he's frequently represented, I see Ivy and Sebastien in a very super-hero like way. Ivy in her very fine boots, riding breeches with pale, soft leather on the insides of the legs, a slightly oversized peacoat, read corset and her bowler, tipped slightly to the side. Sebastien in a long cloak, the hem a pack of dogs swarming dust and movement and a fine three barrelled pistol all dark wood and inlaid (with care) with swirls of copper and brass. Cold Stone and Ivy satisfies cravings for smart humour, detailed steampunk, icy thrills and an honest to goodness who-done-it. Please, treat yourself. You really, really should. "I see Ivy and Sebastien in a very super-hero like way. Ivy in her very fine boots, riding breeches with pale, soft leather on the insides of the legs, a slightly oversized peacoat, read corset and her bowler, tipped slightly to the side. Sebastien in a long cloak, the hem a pack of dogs swarming dust and movement and a fine three barrelled pistol all dark wood and inlaid (with care) with swirls of copper and brass." - LOVE this image!! !